Water sports at Club Med, Grace Bay Beach. Providenciales is home to many amazing beachfront resorts, many with an incredible range of amenities and a great ambiance. Several luxury resorts offer a day pass or evening pass, so visitors to the Turk and Caicos that are staying in a vacation rental or smaller hotel can enjoy an all-inclusive experience for a day. The larger all-inclusive resorts, Beaches Turks and Caicos and Club Med Turquoise, include unlimited food and beverages with the day pass. Passes at the all-inclusive resorts typically allow entrance at 10am, which excludes breakfast. Day passes in some cases can offer a great value, but be aware of some of the boat charter options on Providenciales. It’s possible to arrange a private excursion for $1000-2000 for a group, which often includes beverages and food. Such trip typically visit uninhabited cays, secluded beaches, the iguana sanctuary of Little Water Cay (Iguana Island), and exquisite snorkelling reefs. Grace Bay at Beaches Turks and Caicos. Beaches Turks and Caicos is the perfect choice for families and children, as their collection of attractions, water sports and restaurants is unparalleled. There’s a water park with slides and a giant pirate ship, several huge swimming pools, lazy river, flow rider surf attraction, game arcades, and live entertainment. Beaches Resort combines several enclaves, and is a massive site. Water sports include Hobie Cat sailboats, water tricycles, kayaks, paddle boards, and snorkel gear. Day pass rates fluctuate according to availability and vacancy at the resort, ranging from about $200-600 per person. All food and drinks are included. Cockburn Harbour on South Caicos. To promote interest in the quiet island of South Caicos, the luxury Sailrock Resort is offering a unique day pass and island hopping excursion from Providenciales. South Caicos offers a completely different perspective to the developed Grace Bay and Providenciales. The small island is the fishing capital of the Turks and Caicos, with the quaint settlement of Cockburn Harbour and remnants of old sea salt industry. 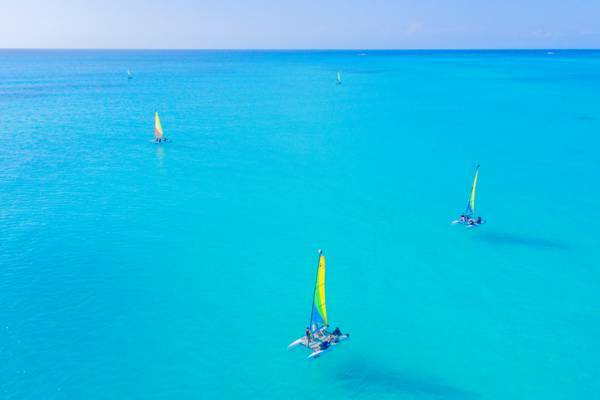 The package includes complimentary transport on Providenciales to the airport, round trip flights (20 minutes each way) by small plane to South Caicos, and access to the resort’s amenities, bicycles, and the non-powered water sports equipment of kayaks, paddle boards, and Hobie Cat sailboats. Price is $150 per person. Contact the resort for reservations. The beach and Hobie Cat sailboats at Club Med. 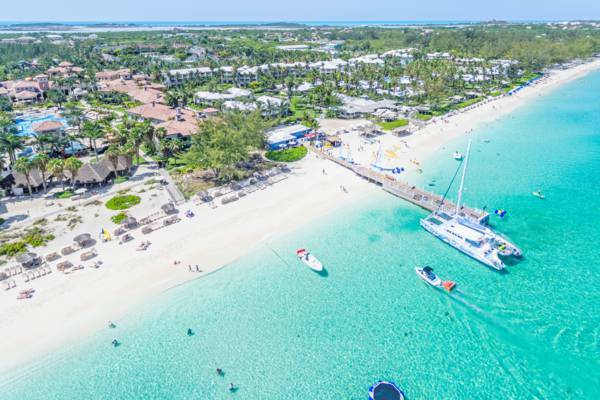 The adults-only Club Med Turkoise has been operating in the Turks and Caicos from the late 1980s, and has always offered great water sports, outdoor activities, and entertainment. The day pass at Club Med has been one of the best kept activity secrets for visitors to Providenciales, as it allows access to a wide range of water sports and excursions at a great price. There are three passes available from Club Med, a day pass for $79 (10am to 6pm), an evening pass for $89 (7pm-2am), and a full day pass for $159 (10am to 2am). The minimum entry age for Club Med is 18. If you’re interested in taking the morning snorkelling cruise, we advise arriving at the dock early, as the boat fills up quickly. Seven Stars Resort at Providenciales. The elegant Seven Stars resort in central Grace Bay is located on an amazing stretch of Grace Bay Beach and features a spectacular pool and great selection of activities. The day pass at Seven Stars includes use of the non-motorised water sports, pool, beach and pool loungers, tennis, bocce, pickle ball, fitness centre, and kid’s camp. Food and beverages are not included with the day pass. Price is $100 per adult, $60 per child, plus 12% government tax. The beautiful Blue Haven Resort, part of the Turks and Caicos Collection group, offers a day pass to the resort, which includes access to the pool, private beach, gym, and outdoor sports facilities and equipment. This complex is located on the picturesque Leeward Channel, and near the verdant wetlands of Mangrove Cay in the Princess Alexandra Nature Reserve. Rates start around $150, and advance reservations are required. Hobie Cat sailboats from Club Med Turkoise off of Grace Bay Beach.